Fall is my favorite season for many reasons, one of which is the availability of pumpkin desserts. Pumpkin pies...pumpkin tarts...pumpkin ice cream...pumpkin bread...pumpkin muffins...pumpkin cupcakes...pumpkin gelato...pumpkin anything! With so many delicious creameries and bakeries here in Seattle, I decided it would be fun to head out and try as many of the city's pumpkin treats as I could in about a week's period. It was tough I tell ya, but someone had to do it :) My pants became a little tight there for a bit, and I had waaay too much sugar in the mornings, but it was a fun adventure and now I get to share my findings with you. I hope you locals enjoy the best of the city and please chime in if I'm missing something...I'm always up for a treat run and I love discovering new places. D'Ambrosio Gelato: Pumpkin gelato that is to-die-for. Tied for #1 with Molly Moon's Pumpkin Clove ice cream. While you're there try the Caramel Fig and Pistachio--neither is to be missed! Some of the best gelato I've had outside Italy can be found here and it's on favorite Seattle street, Ballard Ave.
Bluebird Creamery: If you live in Phinney Ridge and don't want to make a schlep to the other creameries, this is a good one to patronize. They are super nice and just opened. Molly Moons: Intense, pumpkin clove ice cream that is truly memorable. I can't even imagine it in sundae form...next time? Husky Deli: Yummiest pumpkin ice cream in West Seattle. Huge portions. 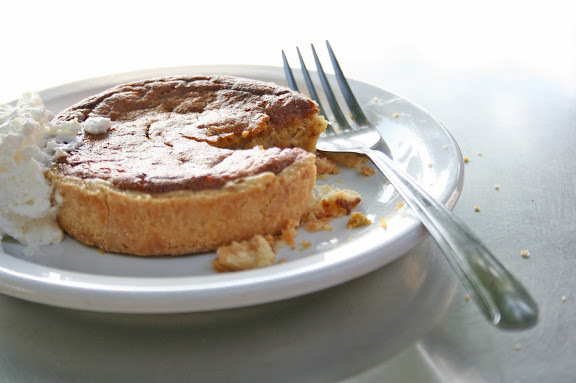 Cafe Besalu: Delicious, made-from-scratch tart that is smooth and delicate. Upper Crust Bakery: The pumpkin wheat bread is perfect for a tasty pb&j sandwich. Not overly pumpkin-y but adds the right amount of flavor and sweetness to a standard loaf of wheat bread. My kids loved it. I missed out on the pumpkin cheesecake over at Bakery Nouveau (my favorite bakery in Seattle), but there's no doubt in my mind it's incredible and worth every calorie--pretty much everything there is! Also, Ballard's Great Harvest Bread is also serving up pumpkin swirl bread, but it wasn't quite out of the oven yet when I stopped by...I'm guessing it's pretty good though! What a great community service blog post! I have never heard of pumpkin ice-cream before. I can't wait to try it one of these days. You will have to try the pumpkin cheesecake from The Confectional. Also, we still need to get together, so maybe we can try the cheesecake at Bakery Nouveau some time soon. This post is pure evil(haha)! I just went to Molly Moons for the first time this week (can you believe that?) and got the salted caramel with hot fudge. Amazing. Now to make the trip into Seattle again to try these heavenly pumpkin desserts! Lisette, I would love that. The Confectional? Not sure I know where or what that is. But it sounds great! Carrie, glad you finally stopped by--so worth it! As a Seattle-ite and dessert lover - thank you, thank you for this post! you have outdone yourself! i hope to get to at least one of these before pumpkin season is over!